This should hopefully be seamless to users. Also, the run time of these compared to previous runs may be different, we will monitor this and treat it appropriately. If there are any issues with these runs, as usual post them here. As a side note, I am taking down Windows 32 bit applications for the duration of these runs as the MilkyWay Separation Modified Fit application does not seem to be running smoothly on this platform for a large group of users. Task (ps_modfit_15_3s_bpl_128wrap_1_1380741004_2337650_0) takes longer, but gets lower credit. Message 60158 - Posted: 17 Oct 2013, 17:51:53 UTC - in response to Message 60156. That would make sense if the GPU usage of these new tasks would be lower, but I just checked and it's rock solid at 98-99%. So I think the credit is not assigned properly. Thanks for the feedback. We will monitor the situation over the next couple days and have a discussion about potentially adjusting the credits awarded for completing these work units. Message 60164 - Posted: 18 Oct 2013, 18:28:17 UTC - in response to Message 60163. Thanks Jake for your answer. One remark in front of your discussion. My credits/day dropped significantly for three tasks per GPU. So IMHO, a adjustment of the credits/WU is absolutely necessary. Jake, I just quickly read your post ( did not see the no win32 sentence in the scan) and then downloaded some win32 stuff which crapped out like usual. You might want to check your queue for any leftover win32 stuff. I think one explanation is necessary to my last post. The credits I got form boincstats were not mine, but the credits of the whole M@H community. So the credit for the whole community dropped. Message 60173 - Posted: 19 Oct 2013, 8:41:19 UTC - in response to Message 60164. You should not look just at the last 3 days, that's not enough. If you look at the last 60 days here, the credit generated by all users was dropping at about constant speed since the 1st October, so long before those WUs were introduced. And we are still higher than 1st September, where a constant increase started. So my guess would be, that around 1st September new runs were started, which payed better than usual (or performed better than avarage, and that resulted in higher credit per day). Those runs probably were finished recently, the current runs pay "normal", so we are returning to normal credit per day. The credits dropped to about 75 % measured against the start of the new run. 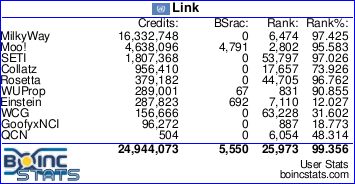 My MW@H RAC has dropped by ~40k during the past few days, it's definitively because of the lower credit for these tasks. Message 60187 - Posted: 20 Oct 2013, 17:39:25 UTC - in response to Message 60179. I cannot second that. I am crunching only modified fit wu and i couldn't notice any increase of credits after first of September. From what I can see on the picture you posted you took a break from Milkyway untill the 3rd September, which makes it of course impossible to see some small changes in credits per day, specially if you look at your RAC and not credits/day. The stats I posted clearly show increase in awarded credit per day for the entire project (that's what you have been talking about in your message 60172) starting around the 1st September and ending around the 1st October, since when it was decreasing again. Yeah, that's another thing, however looking just at your computer or only higher-end GPUs like yours might lead to wrong conclusions, on the "normal" separation we also had runs which apeared to give less credit/time simply because they were not able to push those GPUs as hard as other runs (on slower GPUs there was no difference in credit/time, they were pushed hard enough). Might be something like that again, since untill now only owners of "7870/7950/7970" complained. Unfortunately I can't run modified fit on my GPU to check. Message 60191 - Posted: 21 Oct 2013, 11:20:47 UTC - in response to Message 60187. Found that old thread, looks like that was you with your 7950 at that time too: click. On my 3850 and as reported in that thread on a 5850 there was no difference. Looks like the server took care of the credit allocation issue. It just needed a couple days to average out the FLOPS to give good credits. You will notice that you get the same number of credits for any modified fit runs, but if you compare this to the MilkyWay_Separation flagship application it is about 33% higher. In average, this will account for the increase in computation time for the new background. If anyone has any questions feel free to post them here. I do nothing but MilkyWay cpu units on my laptop and have gone from a high of 10k credits per day on 15 Oct 2013 to a current low of still dipping downwards towards 8k per day today. I crunch all the different kinds of cpu units, but my rac IS DROPPING!!! NOTHING has changed on the laptop, except my rac has dropped dramatically. I have several other pc's also crunching cpu units here and have gone from a high of just over 63k per day to a current 45k yesterday! So while things may be 'good' on your end, my end is not seeing it that way!!! Thanks for bringing it up, it is curious that modified fit without the new background takes much longer than regular separation. I will look into it. Message 60292 - Posted: 3 Nov 2013, 15:45:38 UTC - in response to Message 60279. I just started a run of MW Separation (Modified fit) for cpus. I am still seeing the problem of varying run times but granting the same credits. The _bpl_ tasks taking nearly twice as long as the other tasks (15.6ksec vs 8.7ksec).